I can't say that I have ever found this to be a problem. I have basically two places where I keep my books at home. One is where literature is to be found, broadly ordered by language (German, English, French, a little Greek and Latin). This is where Nietzsche can be found. The other is for Philosophy (and other non-fiction). Those who seek guidance might find this interesting. Be sure to read also the comments! No further comment—at least not by me! 1. Actually, there is a third place now: my computer(s). See also here. David Weinberger has done this blog the honor of calling it "fascinating." He makes this comment in the context of his report on a recent Harvard conference on the book. I wish I'd know about it, as I could have made a trip across the river and not only learned more about the history of the book, but also met David himself. In any case, the blog entry also contains a picture of a cabinet for note-taking by Vincent Placcius with the comment: "The cabinet was designed by Vincentius Placcius. It had 3,000 hooks for topics, each with places where you could hang scraps of paper with notes pertaining to those topics." Well, actually this is not quite true. What is true is that Placcius published in 1689 a book called De arte excerpendi: Vom Gelahrten Buchhalten (Stockholm/Hamburg): "On the Art of Excerpting. Of [the Method] of Learned Bookkeeping." In it, he described not just John Locke's method of making common-place books and other methods of keeping notes, but also included an anonymous treatise about an "arca studiorum" without (perhaps) all-too clearly identifying it as not being his own. The manuscript of the treatise is now to be found in the British Library. Noel Malcolm, in his "Thomas Harrison and his `Ark of Studies': An Episode in the History of the Organization of Knowledge," The Seventeenth Century 19 (2004), pp. 196-232, does a good job tracing the manuscript to the circle around Hartli(e)b (ca. 1600 – 1662), a German, who lived in England, and who is known as a polymath close to Comenius. Hartlib knew Joachim Jungius. Thus he wrote to Robert Boyle: "Dr. Jungius of Hamburgh, one of the best logicians in all Germany. For he conceives if that art were truly understood and applied, not only botanical, but all real studies whatsoever would flourish more than they have done since the fall of Adam." Boyle does not seem to have agreed, but this does not matter here. What matters is that it is likely that the manuscript about the "arca studiorum" came to Placcius by way of Hartlib, for Placcius was a student of Jungius and he was also acquainted with Johann Adolf Tassius, Jungius' closest friend, who also had close connections with Hartlib and Comenius. Leibniz in turn was deeply influenced by Jungius and his circle, and not just in his method of note-taking. A government official in Hannover had an "Ark of Study" built for his own purposes, which Leibniz bought after the latter's death. This is where he kept his many notes, though probably not a million. 1. The book seems to have circulated in manuscript form long before it was published. 2. "Manuscriptum ipsum exhibitum anonymi ..." See also p. 121, where he says: "Scrinium hoc inventionis mea non est," i.e. "this chest has not been invented by me." On the next page he actually refers to Tassius as the person who communicated the manuscript to him. And on p. 123 he clearly states what he has added himself. See also p. 132. 3. Vielmehr schaffte er sich nachher einen besondern Schrank an, seine Excerpta aufzubewahren; womit es diese Bewandtniß hat. Vincentius Placcius gab de arte excerpendi, vom gelehrten Buchhalten, 1689 zu Hamburg ein Buch in 8. heraus, worin er allerhand Methoden des Excerpierens beybringet. Membr. III, p. 150 wird sein hierzu angegebener Schrank in Kupfer vorgestellt. Nach dieser Invention ließ sich der Hannöverische Secretair Clacius einen gleichförmigen Schrank verfertigen. Nach dessen Tode kaufte ihn Herr von Leibniz. Und dies ist der so genannte Leibnizische ,Exzerpir-Schrank, welcher nunmehr in der königl. Bibliothek aufbehalten wird. This is in reference to the previous entry. It is also in reference to other accounts of the history of index cards, such as that of Markus Krajewski's ZettelWirtschaft. Die Geburt der Kartei aus dem Geiste der Bibliothek (Kadmos Verlag, Berlin, 2002), for instance, which gives a partial description of the role of playing cards and other matters in the history of index cards. Will Levenger save the Index Card? Perhaps it does not need saving. One might also say that with friends like this, it doesn't need enemies. Many of the "facts" provided aren't factual. I have always found Outliners useful. Thus I have used Ecco for a long time (and it is still installed on my computer, though I rarely use it. Here is a good review of some applications dedicated to outlining. One correction: TkOutline, one of the few one-pane outliners available for Windows and Unix, also runs on the Mac with the Platform Independent starkit (tkoutline-0.93.kit). At least it used to. 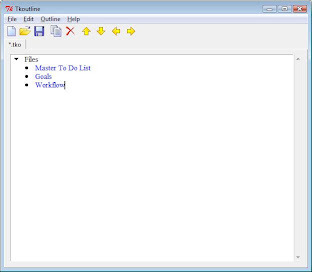 "For Microsoft Windows, Tkoutline is distributed as a single file, installation-free executable. For other platforms (Mac, Linux, etc.) it it requires just two files—a platform dependent interpreter and a platform independent “starkit” that is executed by the interpreter." There seem to be problems with Tcl/Tk 8.5 and Mac OS X, but it seems to run with 8.4.13. It's too bad that it does not seem to be actively developed anymore. It still is one of the few outliners that can link outlines by wiki-links, which is very good for todo lists, for instance. (Jreepad is another. It's based on Treepad, a two-pane outliner that can be used as a one-pane outliner because it has three views: tree only, article only, and tree and article. I find Jreepad cumbersome—and not just because it's written in Java). But dedicated outliners are not the only game in town. Since ConnectedText has now an outliner that allows linking to topics, I don't miss the dedicated variety any longer. 1. See also my earlier post on Outlines and Meshes. 2. It seems to be motivated by the recent devastation of the Wikipedia Outliner page, which has been edited so as to remove everything that made it useful. bind your own paper notebooks, that is. The Website says: "Papel is a unique editor which is designed to provide an intuitive workspace for creative writers. 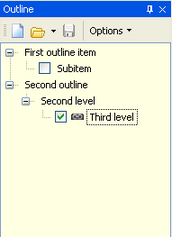 It enables you to visually arrange the components of your story, and quickly edit them without the need to open files. Papels are iconic types which you create in a workspace, name and describe, open for editing, move around, group, link together, merge, compile, and rearrange as you wish. Moving around your writing project is easy: the workspace size is user definable, and it can be grab-scrolled with the mouse. The papel icons and types can be defined in a Theme, so you can create whatever kind of writing project you choose. Papel also includes nine languages besides English." They also say that it works by "making it easy for the rational side of your mind to stay quietly out of the way." I guess it's supposed to "silence the inner critic." Whether or not that is a good idea, the program looks interesting. I tried a previous incarnation ... argh ... implementation of the program, but it did not click with me. It's "powerful simplicity" was a bit too simple and a little less powerful than I had hoped. It has some features that remind me of Scrivener. But there is a list of "requirements" here. Though it is an interesting idea, the site is ultimately not designed to inspire confidence: "So I thought, if I could learn how to code a GUI, maybe I could create the next great noveling tool. Or if someone else knew how to do this, they could look at these requirements and do it for me (and all novelists out there)." Seems like a more or less empty promise: "... if ... maybe ... I ... or ... someone else ... could ..."
There is a description of the old Georg Wilhelm Friedrich Hegel, which says that he "sat at a very broad writing desk, and presently dug around impatiently in an disorderly stacked and scrambled heap of books and papers. Not the picture of "the most systematic of the post-Kantian idealists" that one might expect, though in some sense perhaps really more representative of the systematicity of of his system than this quote from the Stanford Encyclopedia of Philosophy. There is a difference between intent and finished or unfinished product—whatever the case may be. It appears that part of the problem was that Hegel never settled on one unified system of note-taking, as someone like Luhmann clearly did. At times, Hegel used the method of note-books or "wastebooks," as they were called in the eighteenth and early nineteenth century. So there are "Aphorisms from the Wastebook." He also used interleaved books, that is, books bound with empty pages on which to write. We know this about at least about one of his own books. And he also used the manuscripts for his lectures for further notes. But, most interestingly, he had—early in his life—developed a system of note-taking, which is described by his own sister as follows: "He approached his reading as follows: Everything that seemed remarkable to him he wrote on a separate sheet of paper, which he identified at the top by a general label under which the particular content had to be subsumed. In the center of the upper edge he then wrote in large letters—not infrequently using Fraktur letters—the keyword of the article. These pages he ordered alphabetically ... and thus could by means of this simple method use his excerpts at any moment. During all his moves, he kept these incunables of his education partly in maps, partly in writing folders, on whose spines he glued labels for orientation. Some people have described this as a Zettelkasten. But this is clearly misleading. They represent a system of maps as described by someone like Blumenbach, for instance. Even if Hegel's Phenomenology has sometimes the appearance of a Zettelkasten, it was probably based on the system of maps. Too bad Hegel did not stay with this system, for it appears to me that the Phenomenology is his strongest book. 1. "Er saß vor einem breiten Schreibtische und wühlte soeben in ungeduldig in unordentlich übereinandergeschichteten, durcheinandergeworfenenen Büchern und Papieren." 2. See also the so-called "Frankfurter Notizen," for instance. 3. "Bei seiner Lektüre ging er nun folgendermaßen zu Werke: Alles, was ihm bemerkenswert schien, schrieb er auf ein einezlnes Blatt, welches er oberhalb mit einer allgemeinen Rubrik bezeichnete, unter welchen der besondere Inhalt subsumiert werden mußte. In die Mitte des oberen Randes schrieb er dann mit großen buchstaben, nicht selten mit Frakturschrift das Stichwort des Artikels. Diese Blätter ornete er für sich wieder nach dem alphabet und war mittelst dieser einfachen Vorrichtung im stande, seine Exzerpte jeden Augenblick zu benutzen. Bei allem Umherziehn hat er diese Inkunabeln seiner Bildung immer aufbewahrt. Sie liegen teils in Mappen, teils in Schreibfutteralen, denen auf dem Rücken eine orientierende Etikette aufgeklebt ist." Joh. Hoffmeister, Dokumente zu Hegels Entwicklung, 1936, p. 398. Zim is not the only Unix desktop wiki that can be run in Windows today. Tomboy is another one. The instructions for installing Tomboy for Windows are here. You need first to install Novell's gtk-sharp 2.12.8 or newer, but it's really a cinch. Not that it's worth it. It's true: "Tomboy is a desktop note-taking application for Linux and Unix. Simple and easy to use, but with potential to help you organize the ideas and information you deal with every day." It now also works in Windows. But that's about it. The search features are rather underdeveloped, and there are no categories or anything else worth speaking of. It does not do anything that ConnectedText or even Zulupad can't do just as well. I will probably delete it just as quickly as I did Zim. Zettels is "a personal web memo note box." They say: "This is not a software for local installation but an internet service. The access to your note box is restricted to your own private use. There is no public area accessible by other users of Zettels. Your privacy will be maintained. The connection from your browser over the internet to your note box at Zettels is "SSL" encrypted. In this way we ensure that only you have access to your memo note box." I have looked at it many times, but I have never signed up. Looks interesting, though. There are many e-books available at Project Gutenberg—28.000, to be precise. They can be easily read on your computer, laptop or netbook using one of the many available software e-book readers, like yBook, or Mobypocket, or Microsoft Reader, or the Palm e-reader, the last three of which also work with other devices. They could also be read with Notepad or some other editor, as they are available as text. However, I find most of these readers cumbersome in varying degrees, and I do not like to use many different applications when one will do. Notepad (or any other text editor) is perhaps the least convenient of all the choices. So I have started a few weeks ago a new project in ConnectedText, called "Books," in which I store e-books downloaded from the Gutenberg Website for reading. I download the text versions, and paste them into separate topics. I do minimal formatting (that is, I search for "_" and and replace it with "//" (for italics), and sometimes I transform the chapters into headings (===Chapter I=== etc.). I can thus browse by a Table of contents, if I want. Yellowish.css will do nicely as a style sheet for such books. More is not needed. What I like most is that I can annotate these books as much or as little as I want to, using links to topics of my own. I can set bookmarks wherever I want, and, perhaps most importantly, the entire text of all books is automatically indexed by the program so that I can easily search for things whose place I have forgotten. If I need to, I can integrate these books with my research. But if I don't want to, I can enjoy them on their own any time I want to. My Netbook, running ConnectedText, is not a Kindle device, but it is more convenient because it does not just serve as an e-book reader. I can only recommend a personal wiki, like ConnectedText, for this purpose (as well). There is a desktop wiki, billed as a "text editor written in Gtk2-Perl which aims to bring the concept of a wiki to your desktop. Every page is saved as a text file with wiki markup. Pages can contain links to other pages, and are saved automatically. Creating a new page is as easy as linking to a non-existing page. Pages are ordered in a hierarchical structure that gives it the look and feel of an outliner. This tool is intended to keep track of TODO lists or to serve as a personal scratch book." It is called Zim. "Zim handles several types of markup, like headings, bullet lists and of course bold, italic and highlighted. This markup is saved as wiki text so you can easily edit it with other editors. Because of the autosave feature you can switch between pages and follow links while editing without worries." You can embed pictures, it has backlinks, and it allows the use of wiki formatting as well. Text is saved in plain text. While it is aimed at UNIX, it can be run in Windows. I installed it on a USB drive, using this distribution: Zim for Windows. Given all the positive press, I was rather disappointed. It is a rather rudimentary implementation of the desktop wiki concept. Its search function is very anemic: no Boolean capabilities, just a search for simple words. The category function is very underdeveloped. It is not suitable for a large amount of data. It works, but its feature set is very limited. If I were restricted to UNIX, I would still prefer Notebook, which I used between 2003 and 2005. See also the earlier entry on Notebook, Voodoopad, and Wikipedia. 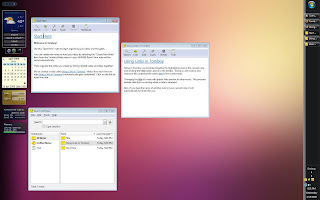 Compared to an application like ConnectedText, it is a rather primitive tool. And it is a huge download. Like so often, I found the hype far outstripped the capabilities of an application written for UNIX or OSX. 1. For an overview of personal desktop wikis, see Personal Wiki and Desktop Wiki. BibblyWiki is a TiddlyWiki application that allows you to keep bibliographical information in a local wiki that consists of just one HTML file. There are many "Tiddlers" out there, but this seems to be the most interesting to me. I have only just played with it, and I don't know whether it is suited for serious work. "QuasiWiki is an experiment in implementing some of the basic principles of wiki in OpenOffice.org Writer. It doesn't turn OpenOffice.org into a fully fledged wiki tool (hence the 'quasi' prefix), but rather adds some wiki-like capabilities. The purpose of the project is to rethink the way OpenOffice.org Writer is used as well as develop some added functionality using the suite's built-in tools." It also uses text2tags. I have not tried QuasiWiki, as I don't use OpenOffice. It looks interesting, however. Learning poetry by heart can be salutary, or so it is claimed in this article. I came across a recent post on Nabokov's Index Cards by Michael Leddy, which I found interesting. Nabokov wrote with Index Cards not so much because they allowed associative progression (or because they were somehow like precursors of hypertext for him), but rather because he had such a clear vision of what he meant to create that he could start anywhere in describing it: "The pattern of the thing precedes the thing. I fill in the gaps of the crossword at any spot I happen to choose. These bits I write on index cards until the novel is done. My schedule is flexible but I am rather particular about my instruments: lined Bristol cards and well-sharpened, not too hard, pencils capped with erasers." "... Since this entire structure, dimly illumined in one's mind, can be compared to a painting, and since you do not have to work gradually from left to right for its proper perception, I may direct my flashlight at any part or particle of the picture when setting it down in writing. I do not begin my novel at the beginning I do not reach chapter three before I reach chapter four... This is why I like writing my stories and novels on index cards, numbering them later when the whole set is complete. Every card is rewritten many times ..."
"find a quiet spot (pace the booming surf and rattling wind) where to write. This I do on scrambled index cards (my text existing already there in invisible lead) which I gradually fill in and sort out, using up in the process more pencil sharpeners than pencils; but I have spoken of this in several earlier questionnaires"